In 2018, I was honored to receive the Torda450 Sermon Award from the UU Partner Church Council, the International Council of UUs, and the UUA International Office. This was for a sermon marking the 450th anniversary of the Edict of Torda, a landmark of religious freedom. The sermon was originally delivered at Westside UU Church in January 2018 (the anniversary month). As the contest winner, I had the great pleasure of joining the first-ever ministers' pilgrimage to Transylvania in July 2018. 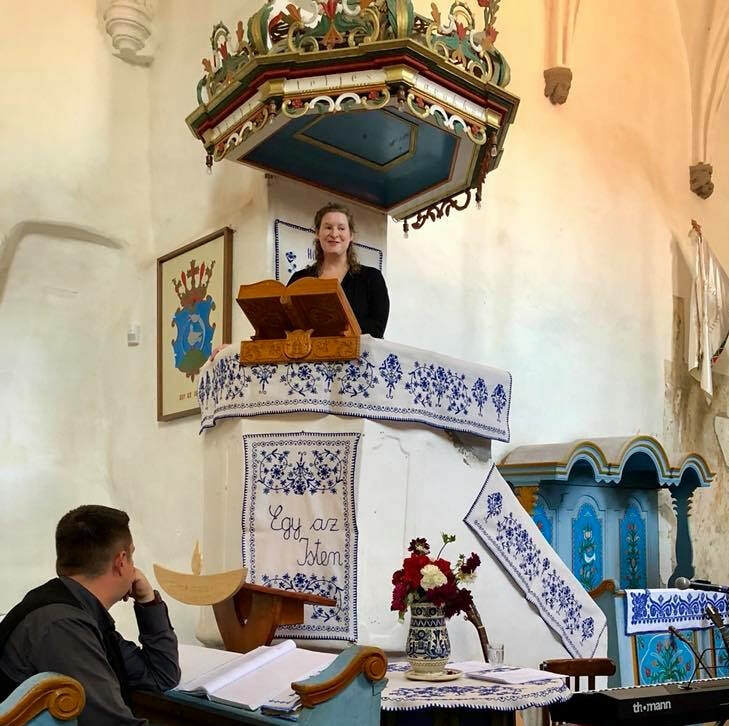 I shared the sermon with my colleagues at the closing of a joint retreat of N. American and Hungarian Unitarian ministers at "the fortress church," an 800+ year old church in Transylvania (as pictured here). Earlier, while preparing for ministry, I received a number of scholarships and awards in recognition of my promise for this vocation. I am particularly grateful to have been chosen as the Spencer and Susan Lavan Scholar at Meadville Lombard Theological School (2012-2015). In my second year of theological school, I received the Chautauqua Award for an Outstanding Student from Meadville Lombard (2014). It was an honor to serve as minister-of-the-week to the UU fellowship at the Chautauqua Institute in New York that summer, preaching in the Hall of Philosophy and sharing conversation with UUs at the Unitarian Universalist House on campus. Visiting with several UUs at Chautauqua after leading worship in the open-air Hall of Philosophy. The UUA also recognized me twice (2013-2014 and 2014-2015) with the Olympia Brown and Max Kapp Award, for a sermon or paper related to our Universalist heritage. At graduation, I accepted two awards: the Charles Billings Prize for Scholarship, and the John Godbey History Prize, for my paper, "A Religion for One World: Kenneth L. Patton, the Charles Street Meeting House, and the New Universalism." Drawing upon this work, I later served as a contributor to the series A Documentary History of Unitarian Universalism, edited by Dan McKanan and published by Skinner House Books (2017). From the period of my formation as a minister, here is a sampling of what colleagues and mentors had to say about my work. Other quotes appear throughout the Ministry pages of this site. It sometimes happens that a person finds himself mentoring a student who, he comes to realize, is likely to accomplish more in this calling than he ever will. That’s a poignant moment. It’s also a blessing. But talent isn’t just a gift. Talent is a responsibility. If Shari continues to honor, grow, and develop the gift she is and can be to the world, her religious tradition, and herself - this time together will have been doubly a blessing for all concerned. Shari is an exceptional Candidate for Fellowship… It has been a pleasure and a privilege to witness this phase of [her] journey. I look forward to “rooting from the sidelines” as she moves into a bright future. As a member, Shari demonstrated religious leadership and social sensitivity in our congregation . . . her board leadership and insight were deeply valued [during our] transition from an operational board to one of policy governance. Shari is organizationally savvy... Her assistance in worship services revealed Shari’s deep belief in the transforming power of love as well as her aesthetic, intellectual and leadership skills. I rate Shari in the top 5% of candidates for whom I have written letters of reference. Over the years it has been inspiring to witness Shari’s discernment regarding her call to ministry . . . It is her life work now finding voice in ministry... Shari and I have been in several ministerial support and networking groups together. She has a solid rapport with colleagues and her manner invites pastoral tenderness as well as enthusiastic conversation amongst colleagues. She recently led an inspiring worship service at our MidAmerica Regional Assembly of which I hear many accolades following… I look forward to having her as a colleague for many years to come. Shari easily finds ways to identify with persons of other cultures, and to initiate beneficial relationships with them across whatever lines of diversity seem to exist. I loved this ritual. I loved the email you sent with all the instructions, and the preparation that you gave [the ritualee]… the ritual itself was spectacular, a deft and beautiful merging of east and west, of Pagan, UU and eastern,.. you are probably the only person who dealt with depths of mystery and unnamable things… loved this aspect. The elements … were perfect, it really worked. It’s original, directed at someone personally, love use of objects … This is A work, and also you were a fabulous participant helping with the chants and all that. Shari is a person with the complete package, not merely the intellectual ability, but the spiritual depth and a kind heart that is so needed in this vocation. She also has a strong commitment to social justice. Shari’s interpersonal skills are impeccable… She is a warm, personable woman with a strong sense of self. She has a history of accomplishing whatever tasks she sets her mind to do, and I would expect nothing different in this new pursuit. ​ [As a newly retired minister who will soon be sitting in the pew instead of the pulpit,] I hope that the minister to whom I will listen, and on whom I will call when in need will be someone like Shari Woodbury. I have not met a better candidate for ministry. I have great faith in Shari's leadership abilities. I have worked with many ministers, staff members, and lay leaders. Shari brings a unique combination of leadership skills and spiritual maturity that put her in line to be among the best of the best. I have no doubt she will be successful in UU ministry, and I recommend her whole-heartedly and without reservation.